QUEZON CITY, Jan 16 (PIA) -- Quezon City has joined the Department of Budget and Management (DBM), Philippine Economic Zone Authority (PEZA), and the National Ecolabelling Program Board Government Institutions in the list of government agencies to pilot-test the implementation of the Green Public Procurement Program (GPP). QC Mayor Herbert Bautista led city government officials Friday morning in signing a memorandum of understanding (MOU) with representatives of the selected pilot government organizations which will serve as models for the GPP program and the Philippine Center for Environmental Protection and Sustainable Development, Inc., to formalize the joint exercise of implementing the program which was provided for under Executive Order 301 that was signed eight years ago. Quezon City will be the country’s first local government unit to pilot-test the GPP program which advocates the sustainable purchase and consumption of green and eco-labelled products and services among government institutions. “We have to go green. Fortunately for Quezon City, we are already there,” said Mayor Bautista. 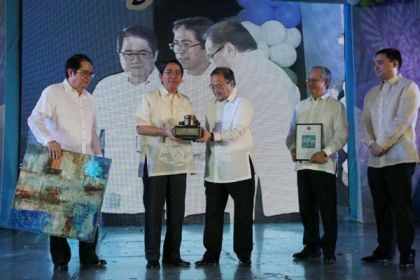 In his speech, Bautista reiterated that environment management will continue to remain as critical foundation for the city’s urban development strategies. “It is my firm resolve to lead Quezon City towards becoming an eco-friendly city, actively lowering its carbon emissions and improving overall environmental quality." To demonstrate this commitment, the city government recently concluded its greenhouse gas inventory for its government-owned operations that aims to determine the city’s carbon emissions and establish reduction targets. This inventory will also help QC in identifying other projects on climate change mitigation and adaptation. QC also pilot-tested the use of light emitting diodes or LEDs to reduce carbon emissions as well as its electricity bills. Along with QC’s biogas emission reduction project which harnesses methane from solid wastes and convert it into electricity, the energy-efficient street lighting program also hopes to explore its carbon finance potential under the Clean Development Mechanism initiative. This year, the mayor said, the city intends to acquire 5,000 units of LED-powered streetlights to illuminate various city roads and densely populated communities. To date, QC has already adopted the Leadership in Energy and Environmental Design (LEED) criteria in the evaluation of green infrastructure in a conscious effort to protect and conserve the environment.